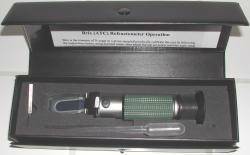 We tested several refractometers before settling on the Professional model offered above. 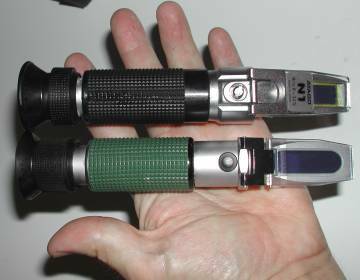 The steel housing is rugged, the optics are excellent with high contrast even in dim lighting, and the accuracy equals the more expensive models shown below. 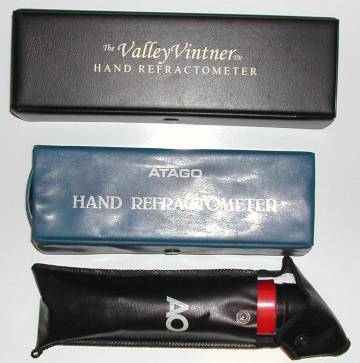 We've extensively tested our Refractometer against the ATAGO 's N1. There's no difference in accuracy although we feel our unit has better resolution and optical clarity. We found it lacking in accuracy, durability, and optical clarity. In our test's the scale was difficult to read even in bright light, it clouded very quickly in humid conditions (like walking outdoors from an air conditioned building or car) and was off by several brix as compared against our unit or the Atago. 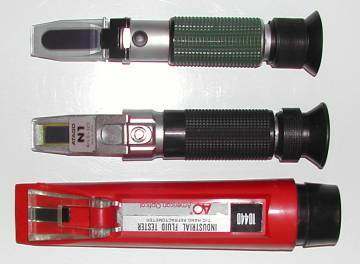 Additionally the samples we purchased all had rust in the calibration set screws. 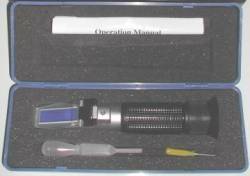 You'll recognize it by the black handle, light weight, and blue plastic case.